Help stop the silence and stigma surrounding mental illness. Western Wisconsin Health is taking part in a community-wide initiative called Make It OK that focuses on reducing stigma by starting conversations about mental illness. Each year, 1 in 5 adults will experience a mental illness, and 60% do not seek treatment according to NAMI (National Alliance on Mental Illness). Even more concerning, 1 in 4 adolescents in grades 9-12 reported feeling sad or hopeless almost every day for 2 weeks in a row or more in the most recent Wisconsin Youth Risk Behavior Survey. The stigma surrounding mental illnesses is one of the barriers that keep people from getting the help they need and deserve. Mental illnesses are treatable health conditions very common in the world today. They can affect anyone, regardless of age, race, religion, or income. Unfortunately, people are still afraid to talk about them due to shame, misunderstanding, negative attitudes, and fear of discrimination. We all have the ability to help to “Make It OK” to talk about mental illness and stop stigma. Learn more about the Make It OK campaign at makeitok.org. Take home resources will be available. A Question and Answer time will be dedicated to your questions and concerns. 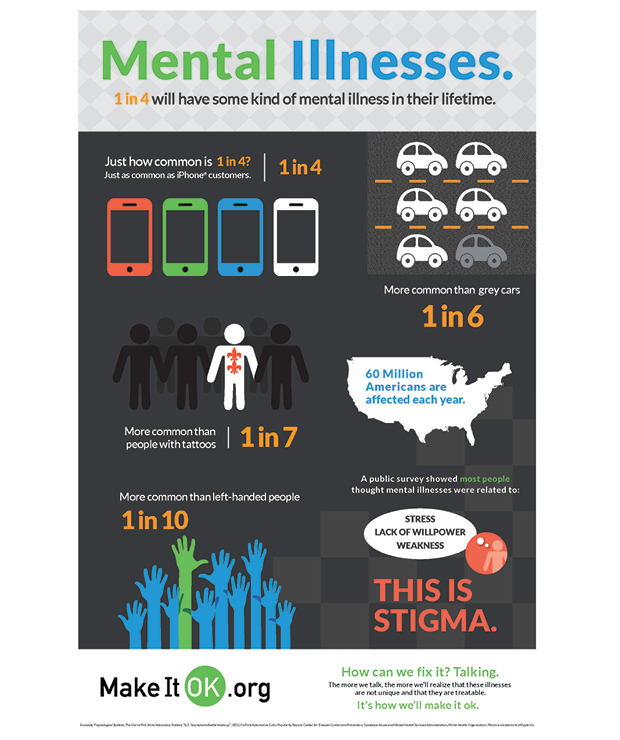 Want to spread the word on ways to reduce mental illness stigma? Consider attending our free training to become a Make It OK ambassador. Training is FREE, but registration is required (see details below). All are welcome. You don’t need to be a mental health expert to participate. Attendees who decide to become a Make it OK Ambassador and present to community groups will be provided the necessary tools and resources. The next Make It Ok Ambassador Training is scheduled for Wed. Nov. 29 from 5-7pm here at Western Wisconsin Health in Conference Room 1. Registration is required. Please register at https://www.wwhealth.org/event/make-it-ok-ambassador-training-2 or call the Community Wellness office at 715-684-1285.